The 303 Firecrest features a 45mm rim that provides aerodynamic advantages while maintaining stable handling in crosswinds for a smooth, stress-free experience even on windy days. A wide, 26.4mm brake track gives the tire a secure stance without impacting rolling resistance and increases stability by nearly eliminating the side bulge effect found in tires mounted to narrower rims. The wider rim makes for more tire volume, and that means lower rolling resistance and more confidence for cornering on rails — all while providing a comfortable ride along the way. 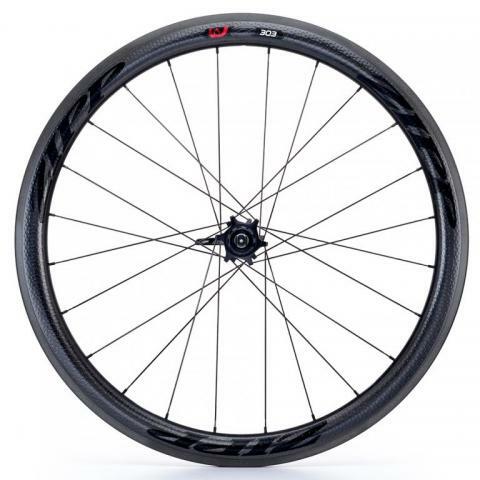 The wheels feature an updated version of Zipp's signature Aerodynamic Boundary Layer Control (ABLC) dimpling, which uses strategically placed and sized dimples across the rim surface to smooth airflow. The even better news is that ABLC enjoys aerodynamic advantages at real-world yaw angles. Compared to many wheels that experience minimum drag numbers at wind angles that rarely occur outside of a wind tunnel, the 303 Firecrests are shaped to handle the windy conditions you'll run into on the actual road. In the middle, Zipp uses its updated 77/177 hubset with improved stiffness and durability over its predecessor for a smooth, supple ride. Featuring a new platform and graphics for 2016, these hubs boast increased bearing protection and are ready to roll without any pre-load adjustment. The rear hub is compatible with a separately sold XD driver body, opening up options for a larger cassette range of up to SRAM's 10-42t if needed. The driver bodies can be swapped out without having to re-dish the wheel, and each wheel includes Zipp's new quick-release skewer with a widened handle for better leverage when setting and a more streamlined look as it sits closer to the frame when closed.